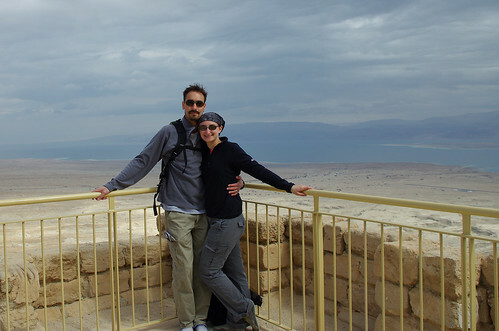 When planning our trip to Israel last year, we made a conscious decision to focus on the South and lesser travelled Negev Desert and leave to next time most of the more typical tourist spots. Well, on Thursday night we leave for the second trip (gotta squeeze it in before Branson repatriates!) and as promised we're all set up for a slightly more traditional visit to the country. Day 1 - arrive early AM for Tel-Aviv. Hoping to catch an architecture walking tour & maybe some beach time before putting on our dancing shoes for a night out. Day 2 - second day in Tel-Aviv. Maybe catch one of the museums (Museum of Art or Eretz Israel) or do some historical sightseeing near the old port. It's pretty full, but should give us a nice cross section of some of the better known parts of Israel. No doubt we'll make substitutions and changes as we go depending on our moods and the situation on the ground. This is particularly true for Day 10 when we're hoping to see "the other side". I'm keen in particular to visit the Quaker Centre in Ramallah, but as with much in this region we'll just have to play this by ear. We are super excited to be going back, not only to get to see the other half of the country, but also for the weather! London's winter has been beyond miserable, so the sunny, warm forecast for Israel is like something out of a dream. Sunshine and an exciting destination? Yes please! We're using the same guidebook from before - our trusty DK Eyewitness Guide for Jerusalem, Israel, Petra & Sinai and Branson has a pretty complete collection of maps for our hikes. No doubt we'll pick up other bits while we're there, but this should provide us with a more than sufficient starting point. I'll be aiming to live blog the trip again this year, so keep your eye peeled this weekend for the next installment!